DÉCLIC – it’s French for “Love at First Sight”, has become a favourite with men who want to stand out from the crowd. DÉCLIC has a strong design culture. It offers a new take on the classics by using beautiful colour, punchy and graphic prints, quirky details and always exceptional quality - delivering on its promise of “anything but boring”. 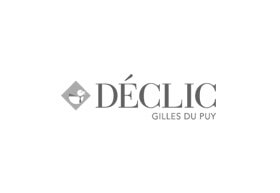 DÉCLIC is renowned for its unique blend of finely crafted workmanship, witty inspired styling and excellent attention to detail.